With a long and storied history, Ann Arbor is one of Michigan's most fascinating cities and a super spot to live and visit. The city is the state's sixth largest, with a population of over 120,000, and is famously the home to the University of Michigan. The city was founded back in 1824 and named after the wives of its two founders, both of whom were named Ann. Boasting a beautiful skyline and various impressive man-made monuments, Ann Arbor is a beautiful city simply to walk around, and one of the best and most original ways to appreciate the scenery of the city is by kayak. The City of Ann Arbor runs various scheduled kayaking tours along the Huron River on a regular basis, with groups of like-minded people getting together in order to appreciate the beauty of the city and its surrounding area from the water. Two different tours start off at the Argo Canoe Livery and Gallup Canoe Livery. The most popular kayaking trip in Ann Arbor, the Argo to Gallup trip lasts for around one and a half hours and covers a distance of almost four miles. The trip starts off with a little rafting along the Argo Cascades and becomes easier and more relaxing as it continues, finishing up with a gentle glide along the calmer waters of the Huron River. Tours run from May through to October and run all day long. Van rides are provided to take kayakers from Gallup Park back to Argo Park for your convenience. This is a very popular trip, especially with groups of friends and families, and there is the option to skip out the rapids section for novice or younger kayakers who prefer to paddle exclusively along calmer waters. It can get quite busy around weekends and sunny days, so it's wise to arrive early. There are no reservations, with the tours running on a first come, first served basis and all minors need to be accompanied by an adult. 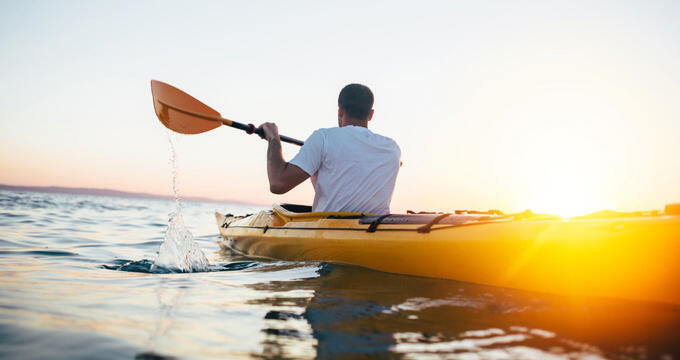 If you're looking for a longer and more intense kayaking experience, the Barton to Gallup kayaking trip could be the ideal one for you. This Ann Arbor kayaking trip runs for around 5.7 miles and lasts between two and three hours in general. It involves a 2-mile paddle session through Argo Pond, past the Argo Cascades and ending up along the calm, tranquil waters of the Huron River. Like the Argo to Gallup kayaking trip, this trip runs from May through to October throughout most of the day and is available on a first come, first served basis. Participants need to have a certain level of physical fitness to complete the trip and negotiate the Argo Cascades section, which involves several small rapids and chutes. Lifejackets must be worn by all participants and everyone needs to sign a risk waiver before setting off on this kayaking trip. Weekends and sunny days are the busiest periods, and the trip actually starts at Gallup Livery, with van drives taking everyone up to Barton Park for the initial stage of the trip. If you’re looking to do some kayaking in Ann Arbor along the Huron River, there are several great spots to rent kayaks around the city. Here are the addresses and contact details of the three main kayak rental sites along the river. All three of these Ann Arbor kayak rental sites are situated in picturesque parks bordering the Huron River, allowing easy access into the river itself to start your kayaking journey. The three locations are spaced out at different stages of the Huron River, providing the perfect starting points for different kayaking routes.